Microsoft will announce their next-generation Xbox next month. The company has sent out invitations for a special press event occurring on May 21st. "On Tuesday May 21st, we’ll mark the beginning of a new generation of games, TV and entertainment," Microsoft's Larry "Major Nelson" Hryb said on his blog. He added that the event will also be streamed on Xbox.com and Xbox Live throughout the world. Gamers in the US and Canada can watch it on Spike TV. During the event, Microsoft will share their "vision for Xbox" and a "taste of the future." Presumably we'll get a look at the next Xbox, its features and a handful of games. The reveal will be continued at Microsoft's E3 press conference on June 11th. During their E3 presser, the company will show off the full software lineup. Early reports about the next Xbox (codenamed Durango) have suggested that it's always-online and doesn't play used games. Microsoft hasn't confirmed or denied whether these controversial features are included in the console. The PlayStation 4, presumably the main rival of the next Xbox in the upcoming console generation, didn't include either feature in spite of rumors to the contrary. If the new Xbox is in fact always-on and blocks used games, that might provide Sony with a crucial marketing edge. 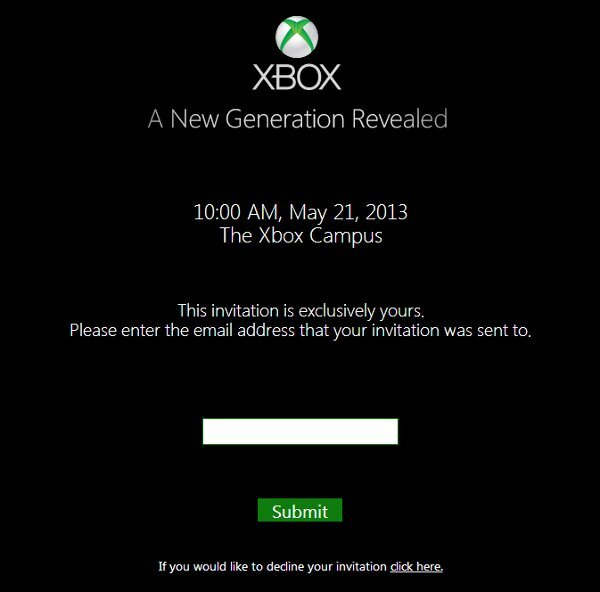 The Xbox event, entitled "A New Generation Revealed," will kick off at 1pm EST/10am PST/17:00 GMT. It's being held at the Xbox Campus in Redmond, Washington.